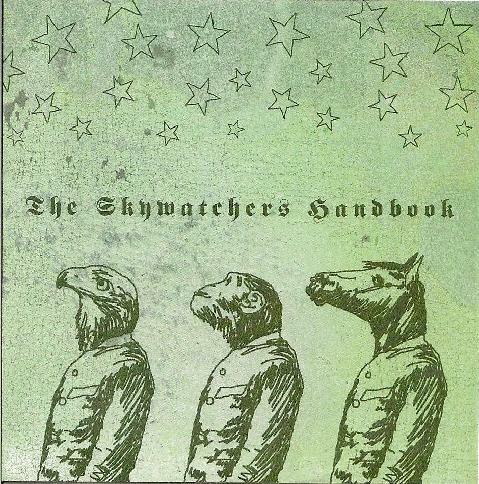 Skywatchers - "The Skywatchers Handbook"
I guess they watch the sky, but they don't really "go there". This is a UK band that plays mellow, somewhat morose... uh... "space-pop-lite"? Sure, why not. The singer reminds of a disc I received years back by Phillip Kane, who was essentially a white soul singer. The Skywatcher dude (no credits listed on the disc) has that same nasal, almost falsetto whine, but in the context of different music. Most of these songs are pretty bland balladry to these ears. The song-writing is decent, but not executed with much originality or "punch", though things improve somewhat mid-way through the album: "Serves Me Right" has a group chorus to shake up the vocal situation... and a keyboard sequence loop somewhat akin to Floyd's "On the Run". Here also the lyrical themes turn more towards the astral. "Small Lights" is a pretty decent space-tango. I actually really enjoy the closer "Keep Watching the Sky", it has a heavier, more ominous vibe with the trippy organ and theremin sounds... and the baritone sax is a nice touch.